Kesällä 2007 pistelin Passione Ricamon ilmaismallin Fairy Celebration 2007. Osallistuin tällä työllä myös Silkweaver Showcase 2007 -kilpailuun. 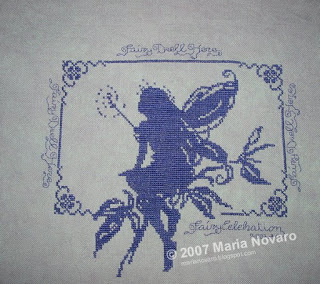 I stitched this Passione Ricamo freebie called Fairy Celebration 2007 in summer 2007. I also entered Silkweaver Showcase 2007 with this work.